Must stop fanning myself with my hands and use them to type now because, my, my, (sounds more like “mah, mah” since I’m speaking Scarlett O’Hara-style) I’ve received a Blogger Recognition Award from the lovely Rae of Bookmark Chronicles. Thank you, Rae! If you enjoy bright, insightful book/TV show/movie reviews that make you feel like you’re chatting with a smart friend, check out Rae’s blog. Nominate other blogs and let them know how awesome you think they are. Share the link to Edge of Night for the original post. If this makes any sense at all, my writing dream feels so much bigger than the small life I live that, for fear of diminishing the dream, I tend not to discuss my writing with friends and family. However, I DO feel comfortable sharing about my awesome, scary, exciting, joyful experiences writing for publication with folks in the blogosphere because they are safe, and they get me. 😉 Which brings me to my next point. 100% be yourself. Read lots of other people’s blogs and be brave about leaving comments, even if they seem lame. Don’t worry that people will judge the crazy, silly, way-too-honest things you write. By blogging honestly, you will find the people who “get” you. 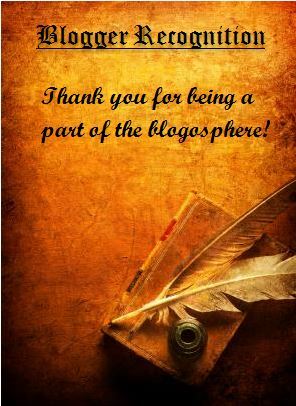 And now – drum roll, please – announcing Eve Messenger’s new Blogger Recognition Award winners! Book Snacks – A mecca of great fantasy book reviews, plus Heidi seems like a really nice person. The Book Minder – Happily stumbled upon this book blog and recently enjoyed a fun back-and-forth comment conversation with its author, the kind and funny Anaya De. Writing Considered – Catherine C. Mead-Brower’s blog is a must-visit for anyone trying to making her way through the writing and publishing world. Agnes Jasinksa – When Agnes writes about topics like enhancement and mind manipulation, it really gets you thinking. She’s so smart! You’re welcome! Thanks for your excellent blog. Best of luck to you in your writing endeavors. Next Next post: Three Books. Which Should I Read First?